Our kindergarten program offers an extension to the Early Learning Program offered through the School Board. The children will develop socially and emotionally through interactions with their peers and the adults who teach them and guide them. This child oriented curriculum provides stimulating activities for all developmental area. Our program ensures that every child will benefit from the educational experiences offered. Our qualified teachers strive to create a positive learning environment which meets the individual needs of the children. 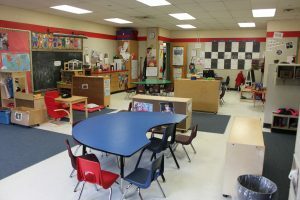 We offer full day care for the children on all non-school days including PA Days, Christmas break, March break and summer break. During the summer we offer an exciting program that involves field trips, visitors to the centre, crafts and fun activities for all children to enjoy.